Made from fermented apples, apple cider vinegar is a common ingredient in cooking. The potential weight-loss and health benefits of this acidic liquid, however, have led many to drink a little of it before meals. While there are some verified health benefits to consuming apple cider vinegar, there are also a few risks and side effects. Consult a healthcare practitioner before making it a regular part of your diet. According to a review published in "Medscape General Medicine" in May 2006, vinegar consumption is linked to both a steadier glucose response and increased satisfaction after meals. The decreased glucose response effect is present in both healthy adults and diabetics, making the consumption of apple cider vinegar and other types of vinegar possibly beneficial in managing glycemic control for diabetics and prediabetics. The combination of this effect and the improved satiety could be responsible for reported weight-loss benefits. Apple cider vinegar is also associated with positive changes in lipid profiles in the body. According to a study published in 2008 in the "Pakistan Journal of Biological Sciences," normal rats showed lower levels of low-density lipoprotein, or "bad" cholesterol, and higher levels of high-density lipoprotein, or "good" cholesterol, after being fed apple cider vinegar regularly for four weeks. Diabetic rats in the experiment also showed reduced triglyceride levels. This study suggests that apple cider vinegar has the potential to help manage diabetic complications, including heart disease risk. All types of vinegar are sources of polyphenols, chemical compounds found naturally in plants. Polyphenols are a type of antioxidant, and apple cider vinegar may have more phenolic compounds than other vinegars because of their production during the fermentation process. Antioxidants eliminate free radicals, which could otherwise damage the body's cells and lead to cancer or chronic disease. While there is no guarantee that antioxidants can prevent these diseases, the antioxidants in apple cider vinegar could lower your overall risk of developing them. Consuming apple cider vinegar is not without a downside. 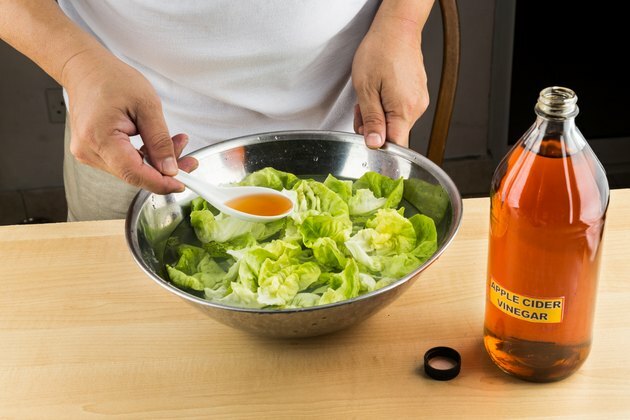 The acidic qualities of vinegar make it potentially damaging to the esophagus and could cause tooth erosion if consumed regularly as a beverage. According to a review published in May 2006 by "Medscape General Medicine," one woman developed hypokalemia after consuming 250 milliliters of apple cider vinegar daily for several years. But the side effects appear to be rare, and many, including inflammation of the esophagus, appear to be reversible.